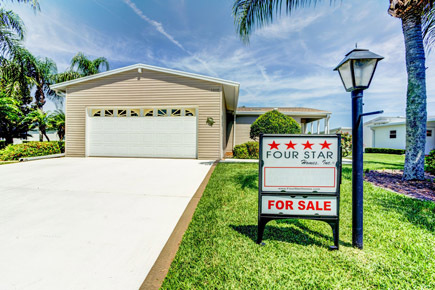 Four Star can help you sell your home. Our re-sale experts specialize in home and property sales throughout Florida. Talk to the Re-sale Experts at Four Star! Trying to sell your home? Let us help you sell your Florida mobile home, manufactured home, or real estate. Our re-sale experts specialize in home and property sales throughout Florida. Help you determine the amount the banks will lend on your home using the N.A.D.A. book or a Comparative Market Analysis. Provide you with a Comparative market Analysis to help you determine the right value for your home, which will attract the right buyers. Pre-qualify potential buyers to avoid wasting your time or compromising your safety with unqualified, ill-intentioned shoppers. Draw up a legally binding contract and hold money in an escrow account. Handle all the legalities including credit authorization, title work, taxes, payoffs, inspections & more. 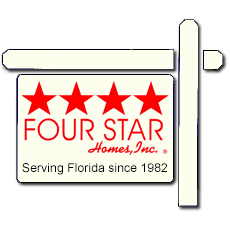 Four Star has specialized in mobile and manufactured home sales since 1982. We are the experts in the industry. "For Sale by Owner" signs are being replaced by Four Star signs. We are proud to have sold over 2,500 homes in 2016 and 2017. We have over 150 agents throughout Central Florida working for you. We have a large advertising budget and place your listing on many other property websites. You are protected against unscrupulous buyers hoping to pay less than market value for your home. No unescorted, unqualified persons will enter your home. Contracts are likely to end in a sale not in a court room. We can assist buyers with financing. You are no longer a prisoner in your home waiting for the bell to ring. Buyers can contact us much easier than they can the home owner. We handle all the paperwork and details. We are more likely to sell your home than other companies, or by yourself. The sale will result in a higher net for you.